As a school business manager, you’ll naturally be keeping a keen eye on any obvious signs of defects or damage to school paintwork on internal and external surfaces. Leaving damage or wear and tear to paint unattended often costs significantly more money to fix later, and also risks the safety and morale of students and teachers. So when inspecting your school’s paintwork, what are the early-warning signs that will tell you it’s time to seek a quote? Weather can have a big impact on the longevity of a paint job, especially if the surface wasn’t prepared properly before painting. In Australia, we battle with extreme temperature fluctuations, not to mention ultraviolet radiation and strong winds, particularly in coastal regions. All of these things will affect school paintwork. Early signs of weather damage include hairline cracks as the dry paint film splits, which can later lead to widespread flaking of the paint chips. You may also see a little sun bleaching of paint, which can lead to more extensive colour morphing in persisting UV rays. It can be remedied fairly simply with some localised wire brushing and sanding before using a primer and another coat of paint. But if left too long, you may need to remove all of it and start again. This is one of those issues that if spotted early, can be easily fixed, and needs the clever eye of an experienced business manager to catch. School painting is, therefore, a preventative maintenance concern, and the reason why strong business managers plan regular maintenance updates as opposed to a once-in-five-years overhaul. Water damage from storms, leaks or even excess moisture escaping through exterior walls can cause considerable damage to school surfaces. The true extent of water damage can be hidden, which is why it’s important to keep an eye out for any early signs like staining, bubbling and peeling of paint. Keep in mind that water damage can lead to toxic mold growth, which brings with it very serious health concerns for those exposed as well as attracting a larger cost to repair the surface and repaint in the future. Moisture may also compromise the structural integrity of buildings, so it’s a good idea to address the problem as soon as possible. A consistent headache for anyone managing a commercial or public building, the estimated cost of graffiti removal in Australia exceeds $1.5 billion annually. The peak age of those who commit this form of vandalism is between 15 and 16 years - high school age - which is why schools are frequent victims. Graffiti can make school buildings to look unsafe and neglected, but perhaps worse, is that it attracts other forms of vandalism too. This makes fast remedial action an important deterrent to repeat vandalism. The colours we surround ourselves with can have a big impact on our lives; they can influence us physiologically and psychologically. Research shows that paint colour choices in schools directly influences the perception of time, increases school pride, and reduces disruptive behaviour, vandalism, and absenteeism. If certain paint colours influence health, morale, emotions, behaviour and the performance of students and teachers, choosing the wrong colours will likely see a decrease in productivity, attention and mental stimulation. In order for students and staff to thrive, a carefully selected and considered school painting colour scheme should be adopted school-wide. If you notice issues like paint flaking, peeling or separation of paint layers, they may be present because of poor surface preparation, insufficient drying time or uneven paint spreading. It’s important to address these issues as soon as possible because paintwork acts as the first line of defence for your buildings. Paint protects buildings against natural deterioration and can eliminate the need for costly school painting projects in the future. Entering into a proactive school painting maintenance agreement with an experienced, commercial painting will save you money by spreading costs over the course of the year. 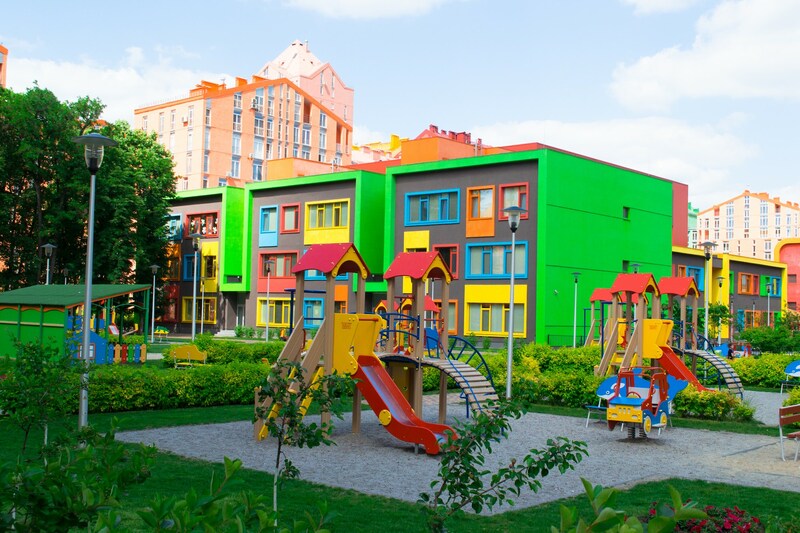 This makes school painting projects more affordable and budget-friendly, plus, professionals are trained to spot the early warning signs before they turn into big problems. A maintenance agreement with Higgins Coatings, for example, may include a complete school repaint in the first year, followed by preventative maintenance every subsequent year. Such a proactive approach helps you to be vigilant about wear and tear as well as emerging issues. Doing so will ensure that your school environment remains safe and clean while always projecting the best possible image.